This listing is for a DIGITAL file ONLY and will be made to match any design of a custom invitation purchased. Goodies and bags are NOT included in this listing. This printable PDF file contains 2 - 10 toppers on a 8.5x11 sheet depending on the size you are ordering. 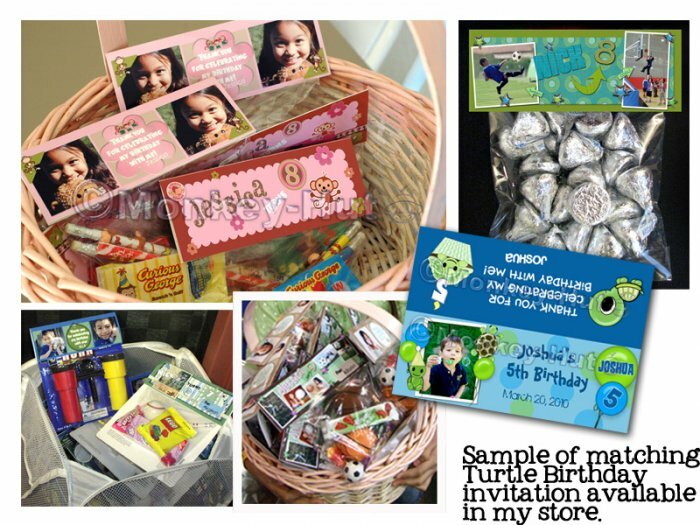 (4) Invitation order # or approximate date custom invitation was purchased as well as the name of the birthday child. A proof will be sent within 1-3 business days of payment and info received. You may print as many as you like on card stock or photo paper. Simply cut out and score them in half on the image side. Fill your baggies with your desired goodies, then attach the toppers to the top of your baggies with a couple of staples. You can use regular ziploc sandwich bags usually 6-1/2"x5-7/8". Ziploc also carries an XL size 7"x8." My local Walmart (as well as some craft stores) carry plastic reclosable bags in several sizes (i.e. 200 2x3's for $1.00, 100 3x4's for $2.00, and 100 4x6's for $2.00). Thanks so much for peeking and have a wonderful day!